Apologies for my long absence. I was traveling for three weeks in September-October and then needed to take care of some business (the kind that pays the bills) before I get back to blogging. Mea culpa. As for the travels, I look forward to sharing photos and thoughts on Spanish and French gardens in upcoming posts. 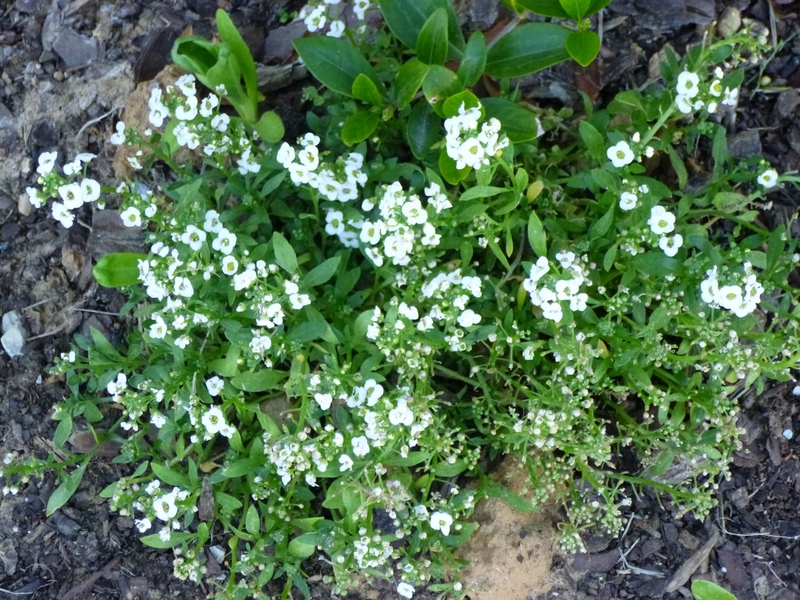 Sweet Alyssum never really got established in the hot spring or early summer, but it has done better in the cooler fall weather - though not as well as last year. I am thinking about trying a heavy winter overseeding to see what happens. Autumn Joy sedum. 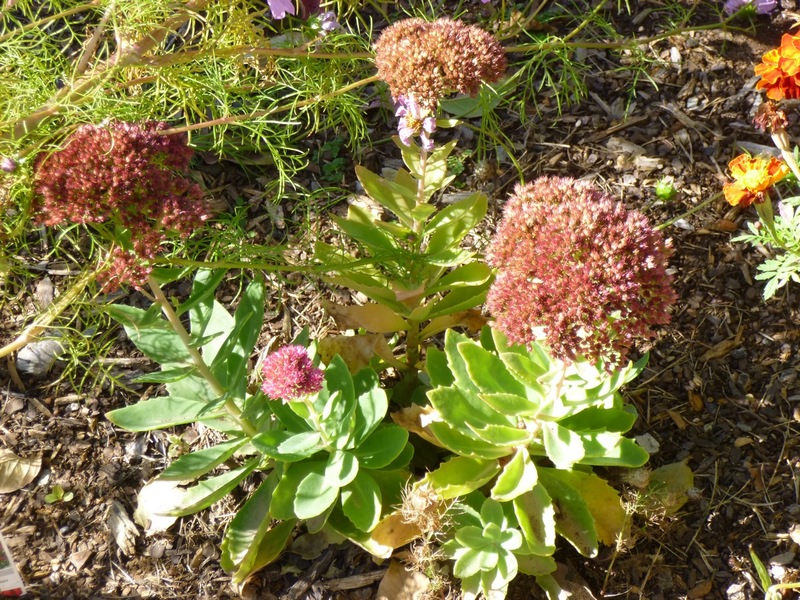 Since it's my first time growing this kind of sedum, I'm not sure why some leaves are yellowing and whether it's a real problem or just a cosmetic issue. 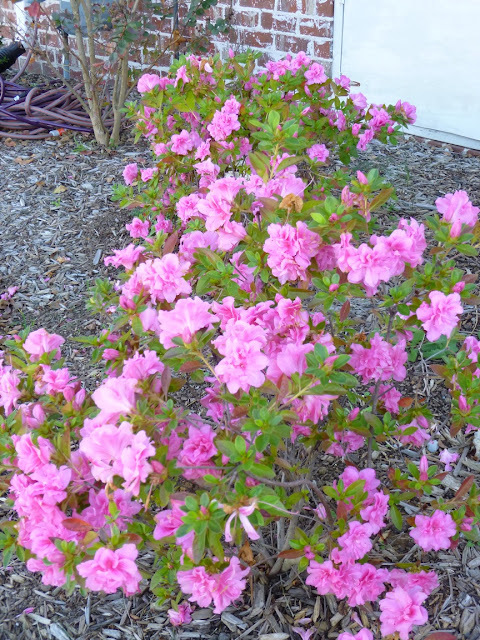 A reblooming azalea. It was here when we bought the house, so I don't know the variety. This one has Eastern exposure. Another reblooming azalea. I like this one better! Unfortunately, since I didn't plant it, I don't know the name of this one either. 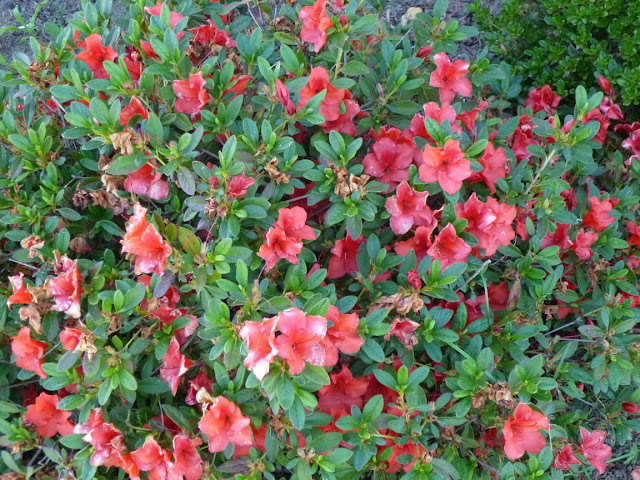 There are about five identical azaleas on this (North) side of the house. Blue Star Creeper (strangely the plant seems to have about five Latin names). 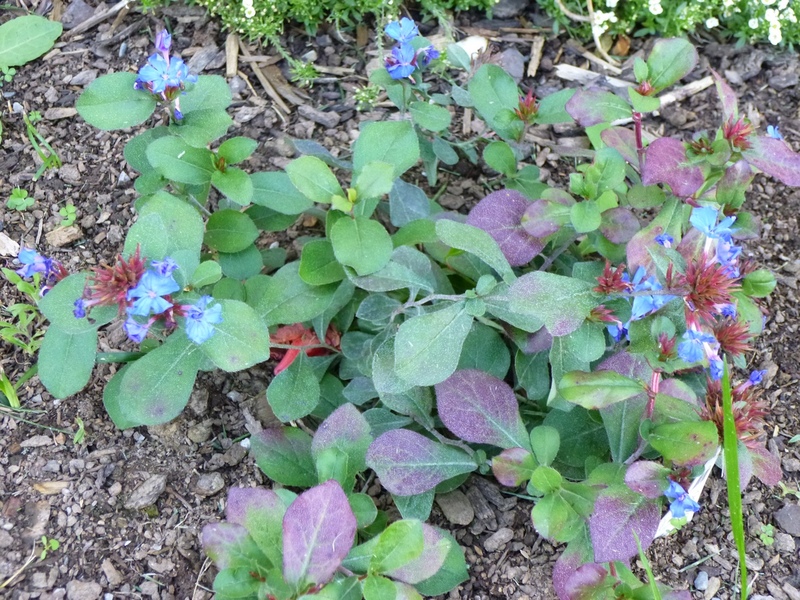 I planted Blue Star Creeper in a Western-facing landscaped bed last year. 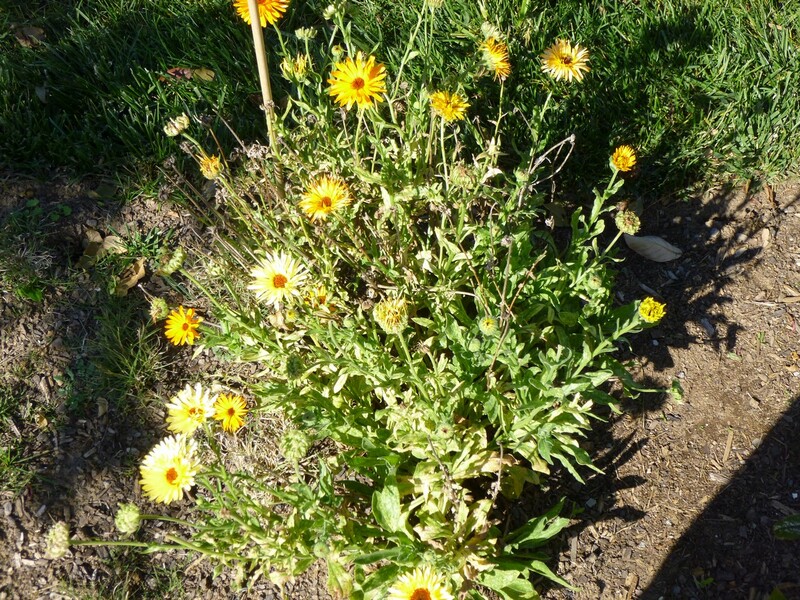 It blooms prettily in the spring, but gets baked into oblivion in the summer, returning in the autumn. I thought I'd see how it might do on the East side of the house, so I transplanted this patch in September. It seems to be settling in nicely, but I'm concerned as to whether low winter temps will damage the plant. I'll post updates to let you know. 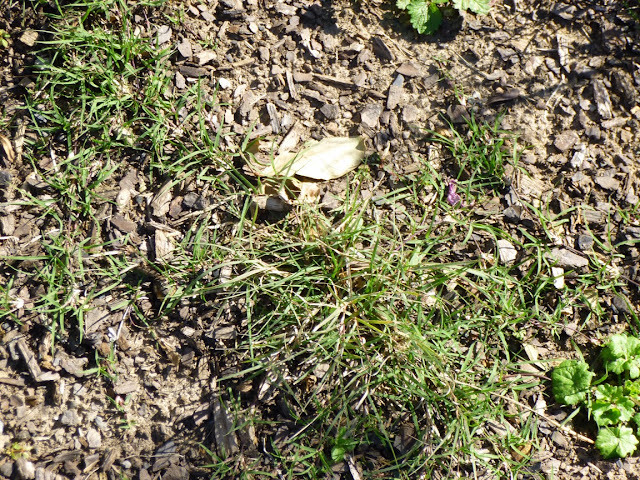 It doesn't look like much, but this part of the buffalo grass patch that I planted back in August. It might be hard to tell from this photo, but I think all the plugs have survived and some have started to spread nicely, but unfortunately they didn't really get a good enough toehold before the weather turned cool, which I believe slows their growth and quickly makes them go dormant. If I were ever to plant buffalo grass again, I would try to plant it in June I think to give the plants a whole summer of robust growth. 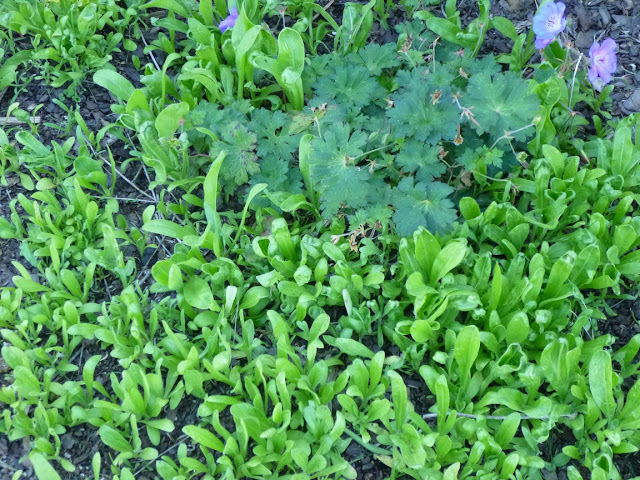 But I will try to keep the patch weeded this winter in the hopes that next spring when it warms up the buffalo grass will form a thick enough groundcover to exclude most weeds. In late October, the backyard still was full of zinnia and French marigold blooms. Pretty much all day long, especially on sunny days, the flowers were alive with bees and butterflies skipping from bloom to bloom. It was a beautiful sight! Heavily-blooming camellia, Eastern exposure. We didn't get any blooms at all on this plant last year. 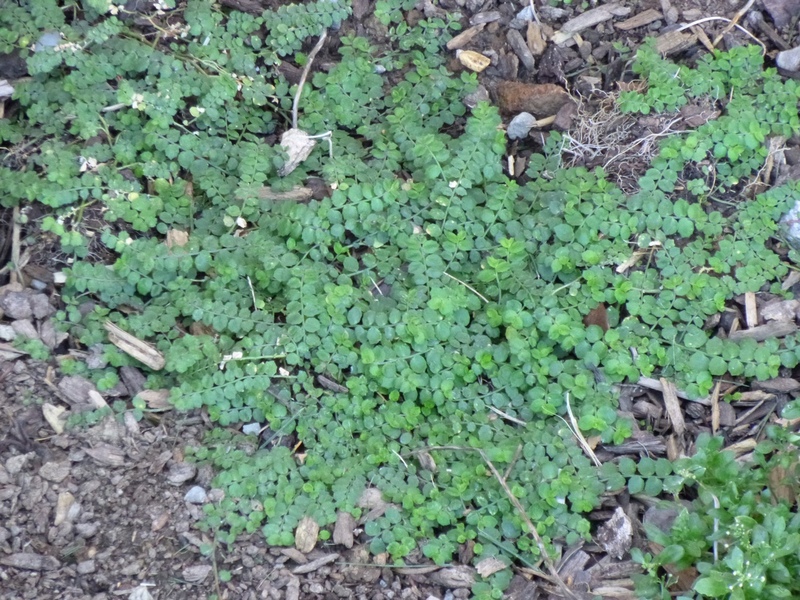 I scattered some acid fertilizer beneath it in late summer / early fall. Perhaps that helped? I really like these flowers. 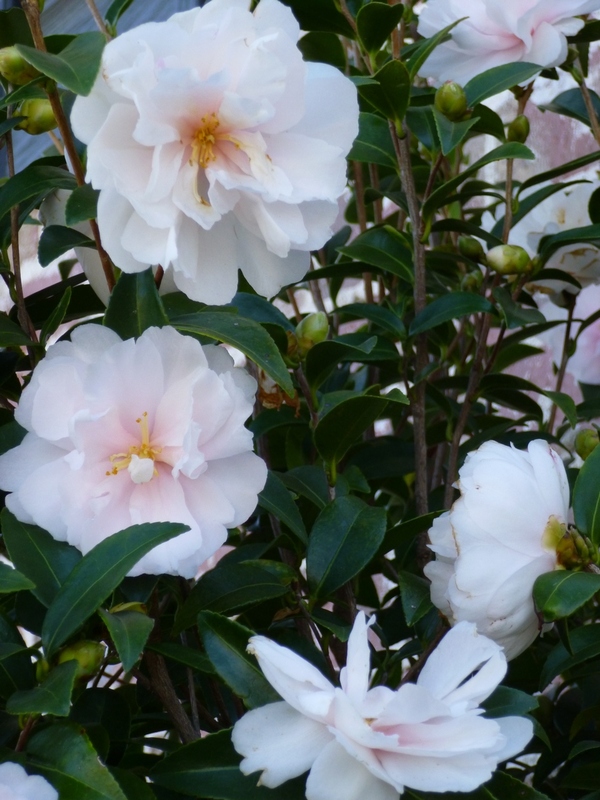 Unlike the one red camellia bush that bloomed last year (but so far just has buds this year), the white petals gently fall off and decorate the ground so that it looks as though there is a patch of snow beneath the plant. And as you can see, the 'flowers' have a sort of pinkish tinge. Just lovely! Sadly, since it was here when we bought the house, I can't identify the variety. Maybe Winter's Snowman or Snow Flurry? Another shot of some of the blooms on the (pinkish-)white camellia. 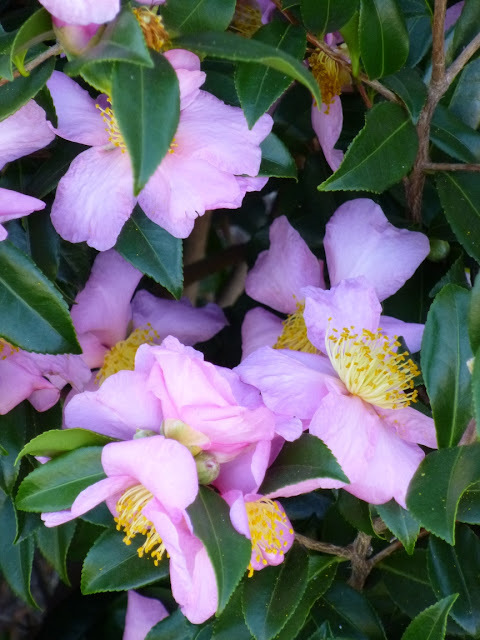 A nearby pink camellia has been blooming as well. Not as many flowers, but these are still beautiful! Again, this was here when we bought the house, so not sure of the variety. Perhaps Pink-a-Boo or Kanjiro? 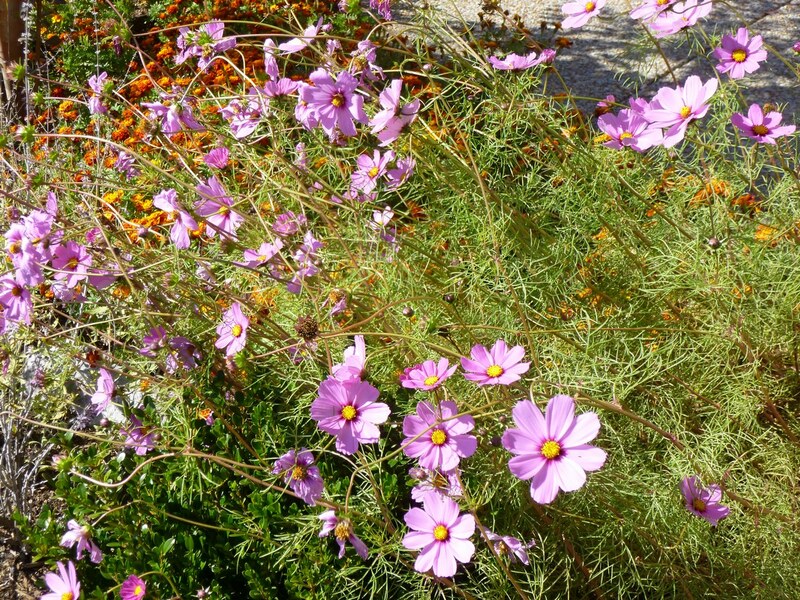 I think the cosmos plants bloomed better in October than they did in the spring or summer! 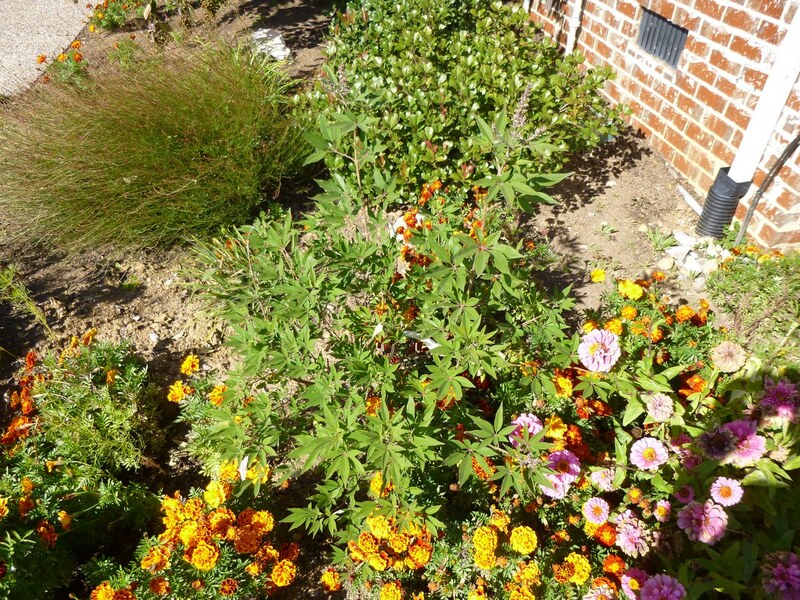 This is the Eastern side of the house, where I had a bed of English marigolds (Calendula officinalis) during the summer. They have, ahem, reseeded rather heavily and sprouted prodigiously in the fall weather. 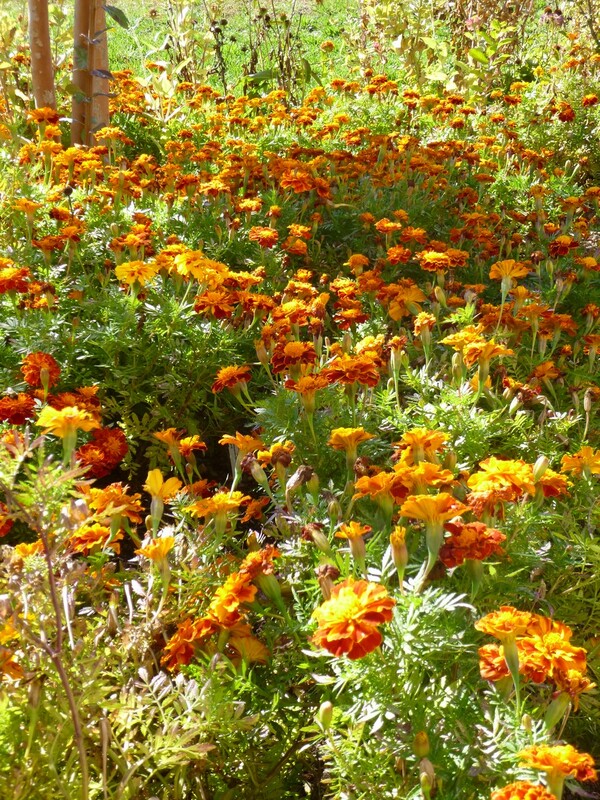 I wasn't a huge fan of the English marigolds, so I'm not so thrilled about the heavy reseeding. But I imagine that many of these plants will die from the cold before they have a chance to create a third-generation of English marigolds! I have uprooted some, but I am leaving others just to see how much cold weather they can withstand. This was one of the few English marigold plants that I left in the ground. 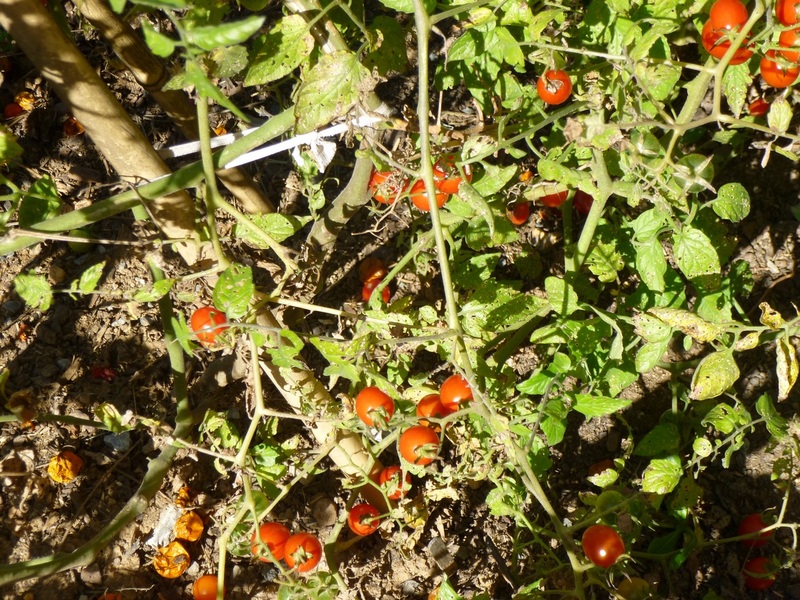 I had uprooted most in August/September when they stopped blooming and became infested with leafhoppers. Clearly, the plant has bounced back and begun blooming in the cooler weather. Hardy Blue Plumbago apparently turns a beautiful shade of purple in the autumn. Just another bonus to one of my favorite perennials! I was worried that everything would be dead in the garden after three-plus weeks of neglect, so it was uplifting and heart-warming to see this gold-and-orange patch of French Marigolds (Tagetes patula). Just gorgeous! The butterflies and bees were all over these flowers. And I think that there were quite a few moths as well, including perhaps a hummingbird moth - the first one I've ever seen in Tennessee! A wonderful autumn sight. Definitely a plant that I would recommend - if the seedlings could survive in the drought and 100+ temps we had this past summer and mature into these types of flowering plants, then I'm pretty sure they can almost anything the Southeast can throw at them. Highly recommended! 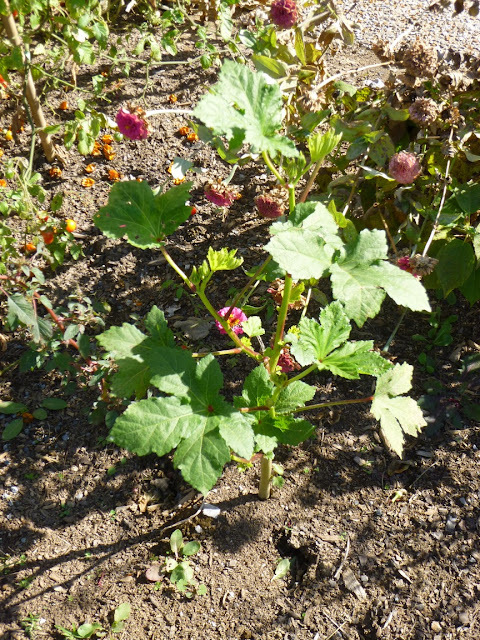 The okra plant that I transplanted in September and highlighted in a blog post is still alive. I don't think it was warm enough while I was gone for the plant to produce any mature pods, but it was still nice to see it standing. Pineapple Sage (Salvia elegans) looked miserable all summer - leaves curled in the drought, I thought it would die despite the supplemental water I gave it. 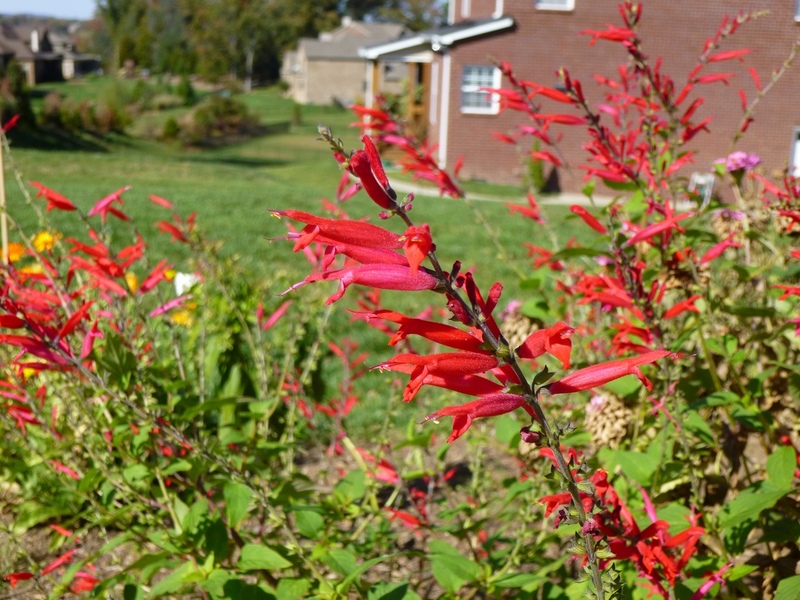 By September, with cooler temps, the planted looked healthier, but I didn't expect it would double or triple in size while I was gone and throw up these sprays of red flowers. What a nice surprise! I think these flowers are supposed to attract hummingbirds, but sadly I saw only a single hummingbird make a brief visit. Maybe you need a whole patch of these plants to catch a hummingbird's attention? 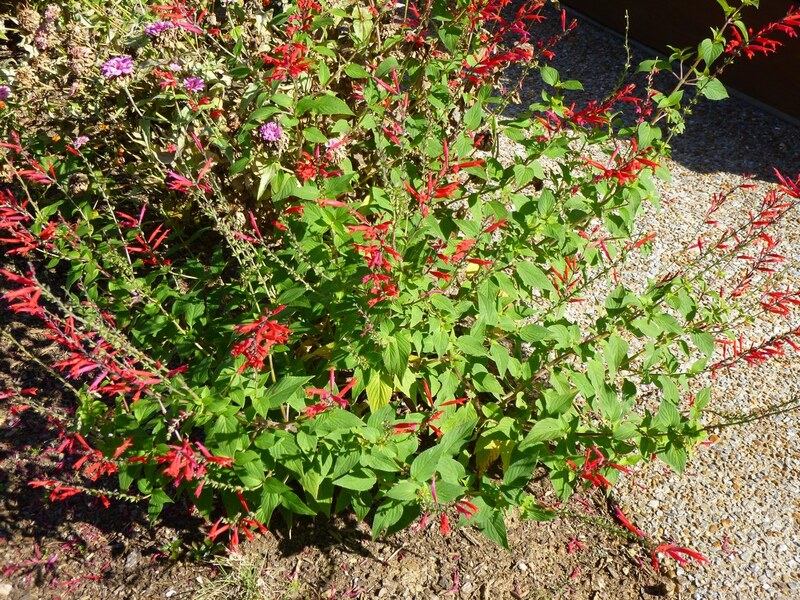 Just another perspective showing the size and shape of the Pineapple Sage. 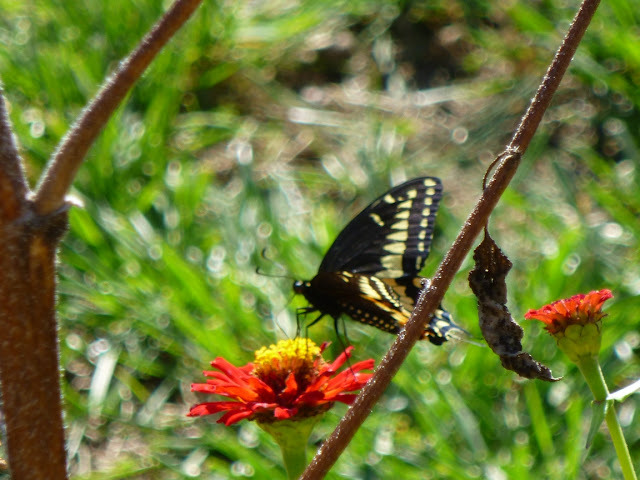 One more shot of a butterfly visiting some zinnia flowers. 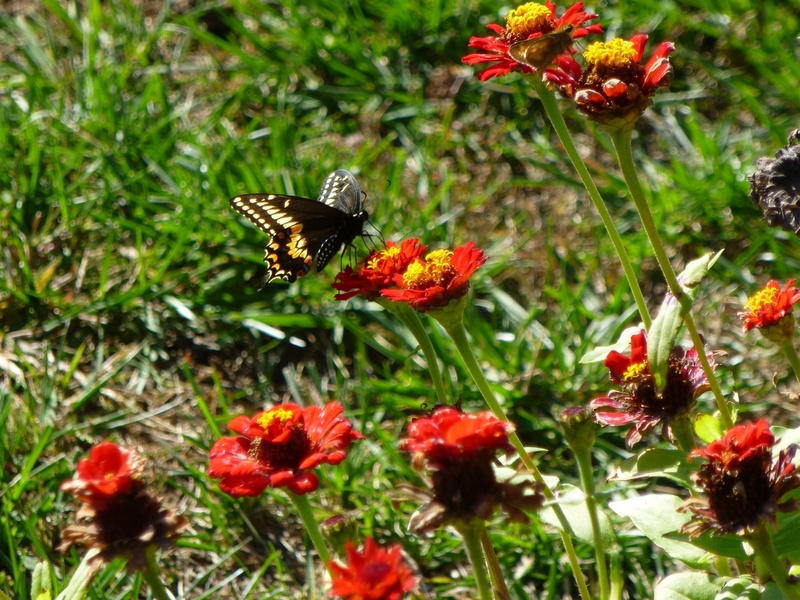 (Notice the smaller dun-colored skipper butterfly in the upper right hand corner of the photo. I didn't intentionally try to capture both butterflies in the frame, but there were so many butterflies flitting about that I just happened to get lucky.) I love butterflies and I love zinnias. Fortunately, they also seem to love each other. Follow the garden from one season to another with a free email subscription. What a rich harvest of late-bloomers. Enjoy! I guess this is the plus side of a warmer climate - my flowers are almost all done for the year. Love the Salvia and Zinnias. Sweet allysum is also a favorite, but the drought and heat just fried it this year in my garden. Jason, Sweet Alyssum did not do so well in my garden this year either. In fact, it looked pretty pathetic most of the year, but it has experienced a new flush of blooms in autumn. Hope you get more temperate weather next growing season! 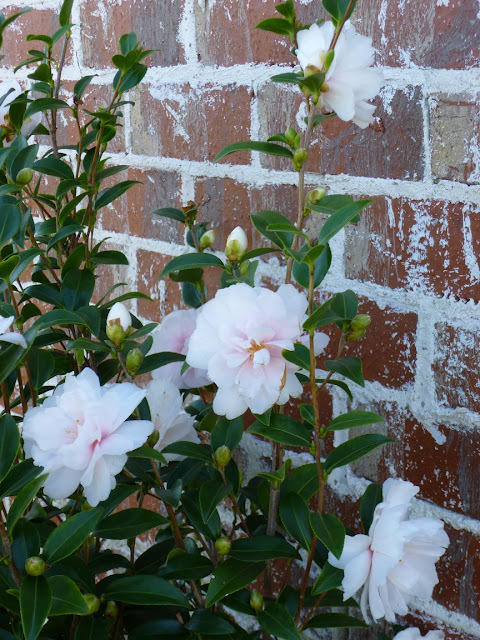 I am loving the camellias! 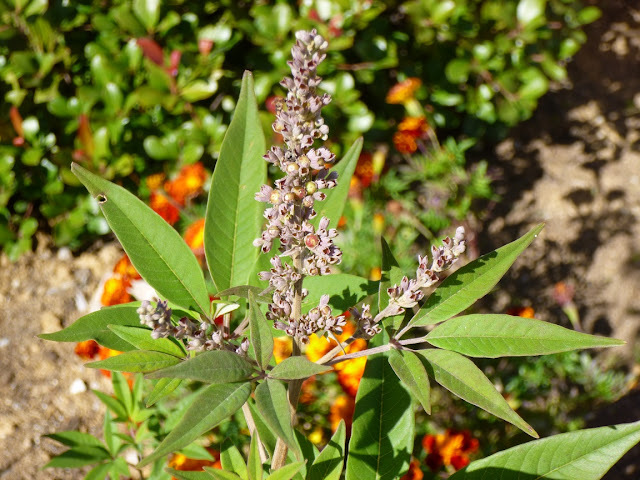 Don't worry about your Vitex you will be surprised how big it will be in three years. If left alone and limbe up properly they can make a HUGE tree. I have the blue one but I'm considering planting the pink one too. I'm loving the camellias too!! The white one in particular is STILL covered with blooms! Thanks for the encouragement also on the Vitex. I am hoping that it will thrive and grow here. Of course, I hope to chronicle that growth on this blog. 25 Gardening Mistakes That I Made in 2012!